GWC Marine LLC, a wholly-owned subsidiary of GWC (Q.P.S.C. 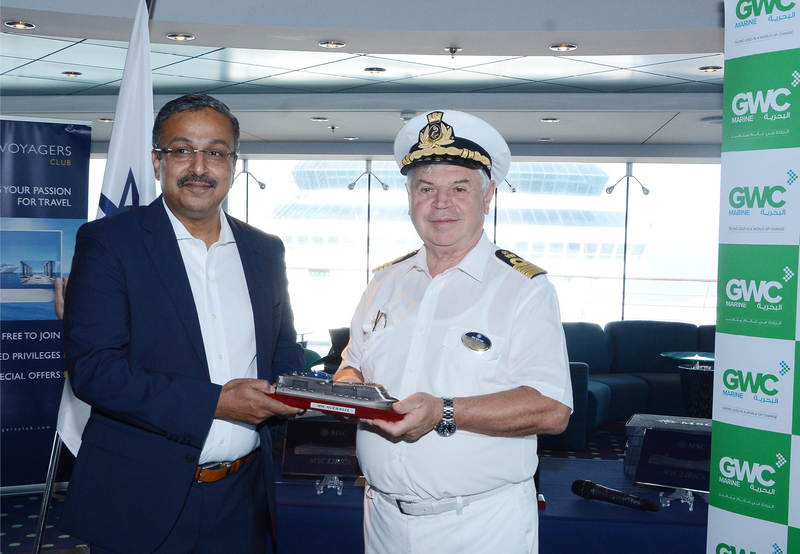 ), Qatar’s leading logistics provider, received the MSC Lirica’s Maiden Call at Doha Port on November 28, 2018. To commemorate the event, a Crest Handing Ceremony was held by GWC aboard the vessel, with GWC Senior Director of Freight Forwarding Mr. Bobby George handing the crest to MSC Lirica Captain Raffaele Ponti, with representatives from GWC’s Top Management, and in the presence of the port and customs authorities, including Doha Port Assistant Manager Mr. Majed Youssef Al-Malki, Assistant Director of Sea Customs Mr. Ahmed Al Sahli, the Head Of Tourism Investment Policy Section Ms. Hend Al Naama, and Cruise Development Consultant Mr. Claudio Alejandro Kindsvater. The MSC Lirica, a giant cruise ship owned and operated by MSC Cruises, holds a maximum capacity of 1,560 passengers and a crew compliment of approximately 732 members, docked at Doha Port for the first time, as the country promotes the growing tourism industry and maritime transport. The revitalization of the Doha Port into a major cruise port in the region is expected to bring significant economic returns to companies, hotels, restaurants, retail, services and tourist attractions in Qatar. The independent redevelopment aims to transform Doha Port into a future hub port for cruise ships and luxury yachts of all sizes, all of which will require the best in shipping agency and agency services to ensure the success of the project. GWC Marine LLC was formed under GWC in 2015 to offer shipping services that meet customers’ growing needs, which include full cargo agency, crew logistics, husbandry, transits, dry docking, bunker calls, protective agency, financial management and fully outsourced solutions managed through their service center hubs. The subsidiary benefits directly from its mother company’s vast experience earned managing freight operations in every port of call throughout the nation, by using the latest technology and infrastructure to manage and keep account of all cargo movement throughout the supply chain. GWC Marine is a wholly owned subsidiary of GWC (Q.P.S.C), established in 2015 to offer shipping services that meet customers’ growing needs, which include full cargo agency, crew logistics, husbandry, transits, dry docking, bunker calls, protective agency, financial management and fully outsourced solutions managed through our service center hubs. GWC Marine benefits directly from its mother company’s vast experience earned managing freight operations in every port of call throughout the nation, the latest technology and software used to manage and keep account of all cargo movement throughout the supply chain, and the vast infrastructure located strategically for rapid response, with the capacity required to handle any project no matter the size, all of which have made GWC industry leaders in the region. Part of the MSC Group is the Swiss-based, world’s largest privately-owned cruise line and brand market leader in Europe and South America, sailing year-round in the Mediterranean and the Caribbean. MSC Cruises employs 23,500 people worldwide and having offices in 70 countries. The cruise-line holds a 7.2% share of all passengers carried in 2017.